The chances of you being caught up in a major incident or emergency are low. Nevertheless they do and have happened within Thames Valley. 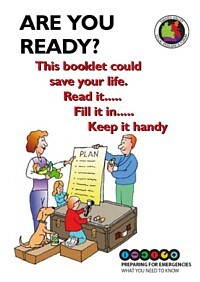 To help you plan for emergencies the Thames Valley Local Resilience Forum have prepared a booklet that informs you of how you and your family can be better prepared. The booklet is available in a number of formats; it can be read online by clicking on the picture below; you can listen to the audio version of chapters listed below of If you would prefer to have a printed copy please contact TVLRF by the methods listed in the Contact Us page. Check out our new online booklet Are You Ready (PDF 1,387KB) updated January 2017 which tests if you are ready and gives advice on what to do to prepare for emergencies.